The mysterious plumes seen on Mars may have a more prosaic explanation: an alignment of sunlight, winter clouds, and topography, with a dash of artifacts. A paper published February 16th in Nature chronicles an unusual cloud seen for several weeks at sunrise on Mars. 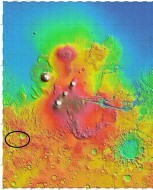 Beginning on March 12, 2012, amateur planetary photographers reported the small “protrusion” along the morning terminator line in the Martian southern hemisphere, within the Terra Cimmeria region at roughly 45° south, 195° west. It was visible for only a short period, lasting 50 to 70 minutes, and disappeared once the Sun rose high enough to fully illuminate the landscape. The feature became more prominent over the following days, varying in size and shape each day, and remained through much of April 2012. This “plume” was not detected by the MARCI instrument aboard the Mars Reconnaissance Orbiter, which records the planet’s surface and thin atmosphere in imaging strips much later in the Martian day, when the feature is not visible. In fact, observations were reported exclusively from amateur observers using telescopes of 8- to 16-inch in aperture and high-speed video cameras for 11 consecutive days from March 12th to 23rd, and also from April 6th to 16th. In all, 18 individual imagers detected the repeating cloud. Agustín Sánchez-Lavega (Universidad del País Vasco and Unidad Asociada Grupo Ciencias Planetarias, Spain) and colleagues measured the brightness of these features using amateur images recorded through red, green, and blue color filters, and determined the clouds to be brightest in shorter (blue) wavelengths. They used the sharpest amateur images to estimate the height of these plumes as 200 to 250 km (120 to 150 miles) above the planet’s surface. This latter estimate is what has caught so many researchers’ attention: clouds should not exist this high in Mars’s atmosphere. Clouds and dust aerosols are all over the place up to about 50 km, with water-vapor clouds being especially prominent when Mars is farthest from the Sun (as it was during these 2012 observations), says Todd Clancy (Space Science Institute). Smaller, carbon-dioxide clouds and hazes (both invisible from Earth because they’re so small and faint) also exist up to about 70 km (for the clouds) and 120 km (hazes). Above about 120 km from the surface, physical conditions in the atmosphere simply shouldn’t allow dust or ice aerosols to exist. The authors acknowledge the surprising altitude and suggest that either water or CO2 ice clouds or possibly even auroral activity could be responsible for these transient phenomena. The area of this event is known to have a strong magnetic anomaly, an ancient magnetic field frozen in the crust that has previously spawned aurorae at about 130 km up. Yet given the brightness of this plume, the aurora would have to be 1,000 times more intense than any seen on Earth to be visible in amateur instruments. While the 2012 observations are unusual and noteworthy, a survey of historical observations show they are not unique. NASA’s Hubble Space Telescope recorded the occasional resence of clouds extending beyond the morning terminator in 1995, 1997, and 1999, though with the exception of the 1997 observation, these were typically less prominent than those captured by amateurs. Additionally, a similar protrusion was captured in roughly the same location on November 8, 2003, by Japanese imager Isao Miyazaki. Going further back, a number of well-respected astronomers have reported visual observations of a similar nature in 1890, 1909, 1924, and 1929, including E. M. Antoniadi. Taken together, these observations are certainly tantalizing. 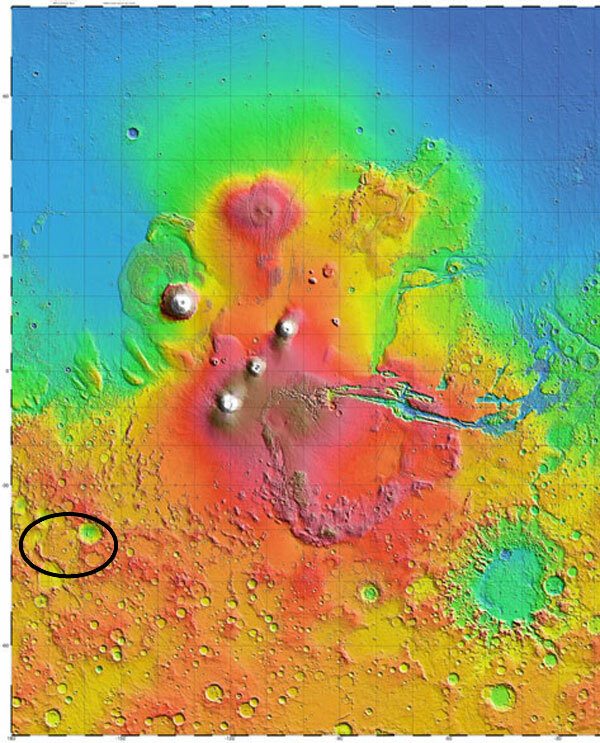 But the underlying topography of Mars might offer an explanation for the latest plumes. Given that Mars is relatively small, topography and meteorology would affect the shape of the night-day terminator line. If the terrain beneath the clouds is higher than the area at the sunrise terminator, the clouds might be illuminated well before the expected sunrise. The effect would make them seem higher than they are. The repeating nature of this 2012 event could then simply be a combination of the Sun’s position in the Martian sky as it enters the winter season in the southern hemisphere and illuminates thin morning clouds, which could arise for a few weeks as the season progresses. This doesn’t require the clouds to be at an unusual height at all. Additionally, we need to consider the impact of amateurs’ planetary-photography techniques. Amateur images often require significant sharpening, depending on the steadiness of the local atmosphere where the image is taken. One well-known artifact of sharpening is limb enhancement (explained here). Features along a high-contrast boundary (such as the edge between the planet and space beyond) are often bloated and exaggerated, depending on how aggressively the photographer applies sharpening. This effect is reduced on the sunrise or sunset terminator, where there is a gradual darkening towards the night side of the planet. Additionally, features along the limb of a planet will be blurred and expanded when stacking hundreds or thousands of individual frames taken in sub-par conditions, which can significantly reduce the accuracy of size measurements of features near a planet’s limb even before sharpening is applied. Among the images analyzed, those from imagers who reported excellent atmospheric conditions show the “plume” smaller and less pronounced than it is in the others. Note that images captured by the Hubble Space Telescope or orbiting spacecraft around Mars don’t require any sharpening at all to reveal high clouds along the edge of the planet, because these spacecraft are not inhibited by Earth’s shimmering atmosphere. This also explains why the Hubble images of such phenomena tend to be much smaller and fainter than those from amateur observations. Sánchez-Lavega says that his team intensively discussed their image analysis, and that four coauthors with extensive planetary-imaging experience each independently measured the images. He also says that they looked at the local topography and concluded there were no depressions or other surface features large enough to affect the clouds’ apparent altitude. Still, while there is no doubt that the feature captured in these amateur images is indeed real, there are still questions about the height measurements made for a feature along the edge of the planet, especially given the techniques required to reveal them. Clearly more research is needed.